Mom: "I just didn't think I was going to get out of there, I thought, 'This is it'"
(CNN) -- Hours after a plane slammed into her home Karen Wielinski gave an exclusive interview to Buffalo radio station WBEN. This is her account based on that interview. 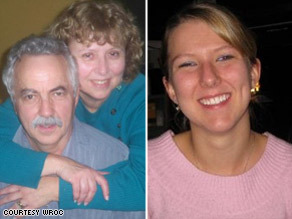 Husband and wife Doug and Karen and daughter Jill were in their house when the plane crashed. Karen Wielinski was watching TV in her home when she heard a plane making an unusually loud noise. "I thought to myself, if that's a plane, it's going to hit something," she said. Then, Continental Airlines Flight 3407 crashed into the Clarence Center, New York, home, trapping her and her family. "And next thing I knew the ceiling was on me," she said. Just before the crash, Wielinski was sitting in the family room watching TV, her 22-year-old daughter Jill was watching TV in the front of the home and her husband Doug had just left the family room to work in the dining room, she said. At first, Karen Wielinski said, she thought the crash wasn't real. But then it became all too real. "I just didn't think I was going to get out of there," she said. "I thought 'This is it,' and kind of panic set in," she said. "I just, I didn't know how much was on top of me, so I was panicking a little but trying to stay cool." That's when Wielinski noticed a glimmer of light to her right. "I don't know if you gain strength when you have to but whatever was on top of me I just pushed off, at least part of it so that I could get out of that hole," she said. "I shouted first in case anybody was out there," she said. "And then kind of pushed what was on me, part of that off and crawled out the hole." When she got out of the hole she heard a woman crying and saw the back of her home was destroyed. "The fire had started," she said. "I could see the wing of the plane." After surveying the disaster she saw her daughter was safe, but hysterically crying. "From what she's saying it appeared the attic kind of came down onto where she was," Wielinski said. "She couldn't get through the windows because of the fire that was there, but she miraculously found an opening and slid out of that." Immediately after the mother and daughter escaped, Wielinski said her daughter asked where her father was. "And I didn't know," Wielinski said. "I just told her we had to get out of there, we had to get away from the fire, because when I knew it was a plane, I knew that there might be explosions or something." So both women ran to the back of the yard and up the street to look for their neighbors. When she was asked early on if she had heard news about her husband, Wielinski said no, and she didn't know whom to ask. "But to me it looked like the plane just came down on the middle of the house, and unfortunately that's where Doug was," she said. The women were taken to the hospital with only minor injuries. Wielinski said her arm was in a sling because she fractured her collarbone. She said her daughter escaped with only scratches on her feet. Wielinski grew emotional talking about her husband. "Oh gosh," she said, beginning to cry. "He was just a good person." All About Buffalo (New York) • U.S. National Transportation Safety Board • Continental Airlines Inc.